JUNEAU — The chairman of the Alaska Senate’s education committee, citing a 1987 Alaska Supreme Court decision, is saying Gov. Mike Dunleavy’s proposed $20 million education funding cut may be illegal. “I think it’s inappropriate to do it this way. This is the wrong way to go about it.,” said Sen. Gary Stevens, R-Kodiak. It might be inappropriate, but is it legal? “I don’t believe it is,” Stevens said. Stevens sought a legal opinion from the legislature’s legal department, but the resulting memo was not definitive, his staff said. Under the Alaska Constitution, the Legislature has the power of the purse. The governor may veto spending items, but the Legislature has the opportunity to override that veto. After that process ends, so does the governor’s ability to change spending amounts. 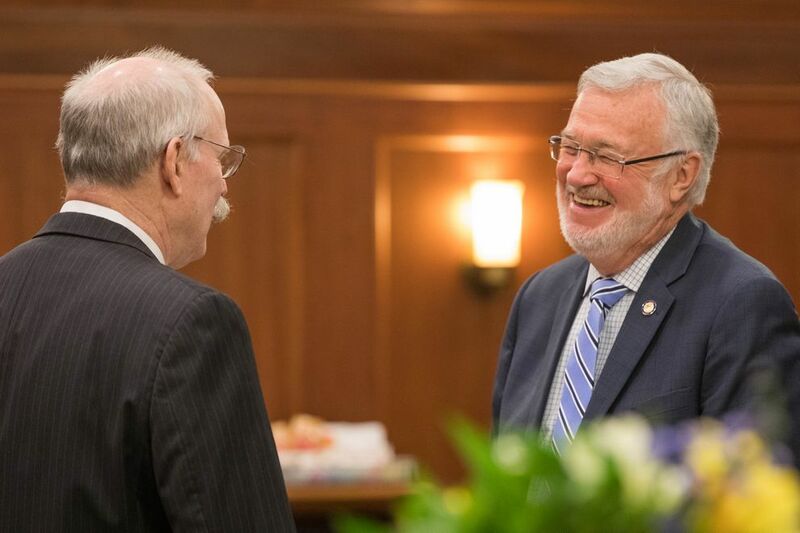 While an Alaska governor can veto spending within a budget bill, the governors in this case had acted outside the veto process, using a section of the Executive Budget Act to justify the move. The Fairbanks North Star Borough sued, saying the governors' orders were unconstitutional, and the Alaska Supreme Court agreed, declaring that the governor had to abide by the traditional budget process. Last year, legislators approved a capital construction and renovation budget that contained $20 million in extra funding for school districts. The funding was scheduled to be distributed based on the average daily attendance at each of the state’s school districts. Donna Arduin, director of the state Office of Management and Budget, told the Senate Finance Committee on Monday that the funds were expected to go to school districts in late January or early February, after schools had counted their students for the year. While the governor has proposed revoking that funding, the Legislature has not approved the move. Meanwhile, the state is delaying payment. By withholding the funds, the Dunleavy administration is violating the Legislature’s authority to appropriate money, Stevens argues. “He’s effectively vetoing funds by not spending them,” Sen. Bill Wielechowski, D-Anchorage, said of the governor’s move. Wielechowski’s comment came during a Thursday news conference, and he was asked about Stevens' belief afterward. “If the governor just chooses not to spend money that the Legislature has appropriated ... yeah, it’d clearly be beyond the constitution,” Wielechowski said. What isn’t clear is whether the governor can temporarily choose to not spend money the Legislature has appropriated, Wielechowski said. “I think there’s a timeline on it, but I don’t know how far," he said. The dispute raised by Stevens and the concerns of other lawmakers amount to a movie trailer ahead of the main feature. On Feb. 13, the governor is expected to introduce a revised budget that includes $1.6 billion in budget cuts — an amount 80 times the size of the $20 million education cut. “I don’t know if we’re seeing a glimpse of what $1.6 billion reductions might become,” said Sen. Natasha von Imhof, R-Anchorage, speaking Monday about the governor’s proposal.